"Alpha Anywhere is ideal for building mobile apps with a common code base so you only have to write code once and can deploy it to different operating systems. What was built with Alpha Anywhere matched our precise specifications, was developed quickly, and cost ten times less than if we had developed separate native apps." World Medical Card, based in Bergen, Norway, stores comprehensive patient medical and health information on a Web site, including conditions, diagnosis history, medications, allergies, and more, in multiple languages. This data is always available to share via a mobile app or physical printed card. People carry the app and/or card with them when they travel, so that emergency rooms and doctors have complete medical details immediately available and can issue a proper diagnosis and administer treatment accordingly. Jeff Benson, of HighBrookCREATE, an independent software development firm, specializes in building applications and apps using Alpha Anywhere and created the mobile app for World Medical Card. Travelers wishing to use the World Medical Card service register at the World Medical Card Web site and fill out forms to detail their medical information. They then request that a physical printed card which contains their medical and health data be mailed to them. They carry it in their wallet when they travel. Patients can update their information and request a new physical card be mailed to them at any time. To expand its service offering, World Medical Card wanted to launch a mobile app for its service that would work on iOS, Android, and Windows Phone. "We wanted a technology that would let us quickly build the app and deploy it to different operating systems, and then easily upgrade it," says Knut Horne, World Medical Card's Chief Technology Officer. A mobile app would mean that customers would immediately be able to have their medical data available for sharing instantly without waiting to receive a new physical card. 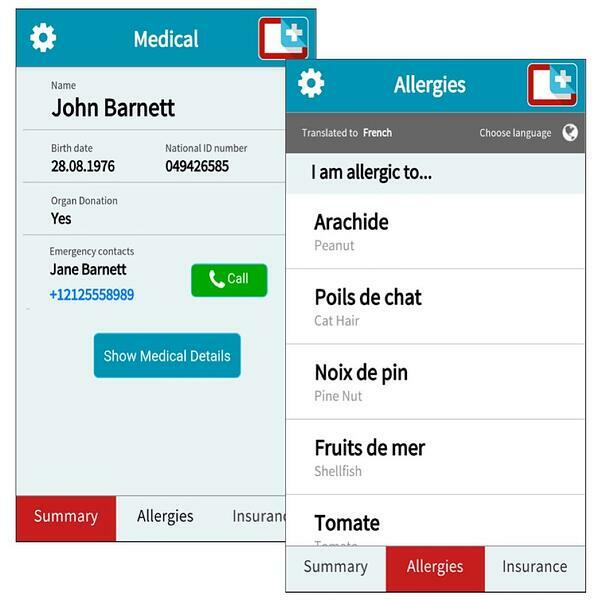 In addition, the mobile app provides features and benefits not available on a printed physical card - for example, instantly providing a translation of a card holder's diagnosis or allergy from English to one of 19 other supported languages. "Alpha Anywhere's rapid mobile app development (RMAD) technology lives up to its claims. It provides all the tools I need to quickly develop apps and deploy them to multiple platforms." Horne faced a basic decision when considering what technology to use: Should his company create native apps or use a hybrid solution? "If we went native, we would have had to build separate apps for iOS and Android, and possibly one for Windows Phone, and another for Blackberry," he says. "I knew how expensive and time-consuming that could be - and how expensive it would be to update and maintain them all. I realized that Alpha Anywhere would be the ideal solution for us because we could write the app once, and then have it run on multiple mobile operating systems." After he decided to use Alpha Anywhere, he hired independent developer Jeff Benson to write the app. He found Benson through a referral from Alpha Software. "With Alpha Anywhere, I was able to quickly meet all of World Medical Card's specs for the app. It would have been much more costly and time-consuming to build separate native apps for each individual platform." Alpha Anywhere has delivered considerable benefits for Benson, World Medical Card, and World Medical Card's customers. "With Alpha Anywhere, I was able to quickly meet all of World Medical Card's specs for the app," Benson says. "It would have been much more costly and time-consuming to build separate native apps for each individual platform. And Alpha Anywhere's extensibility and open framework meant I could easily integrate the app with World Medical Card's WordPress powered website." World Medical Card's Horne agrees. "I had an estimate from a Scandinavian development company on what it would cost to build native apps, and it would have cost us at least 10 times as much to do it that way instead of using Alpha Anywhere," he says. "The actual costs would have been even more than that, because that estimate was only for the initial apps, not for revisions and upgrades." As for the iOS and Android app built with Alpha Anywhere, he says, "The app is as good as it can possibly be. Building native apps would not have been an improvement." Using their mobile devices and the new mobile app built with Alpha Anywhere, World Medical Card customers can be proactive about protecting their health while traveling. For example, if they have a food allergy and they are abroad in a restaurant, they can pull up the app, and display the allergy information to their waiter in the waiter's native language, because the app works in 19 languages. World Medical Card plans to use Alpha Anywhere for more than just the mobile app. Benson is working on internal browser-based applications for company employees, which they will use to manage World Medical Card's backend that contains comprehensive information about medications, diagnoses, allergies, and provides translations to 19 languages, with more to come. The Alpha Anywhere-built applications communicate with a backend MySQL database. Benson is working to integrate new applications with WordPress, which powers the World Medical Card website. The World Medical Card mobile app is currently available for download from the Apple App store, the Google Play store, and the Microsoft Windows Phone App store. Customers enter their data through their account on the World Medical Card website and then can sync the mobile app with their web account at any time. Medical data is securely stored on the mobile device and is available for display and review even when the mobile device is disconnected. "Alpha Anywhere has been ideal for what we needed done," Horne concludes. "We've quickly built and deployed the mobile app we wanted to multiple operating systems, and it was finished at far less cost that if we had done native app development. And we'll be able to easily update the app quickly and inexpensively going forward." "Alpha Anywhere has been ideal for what we needed done. We've quickly built and deployed the mobile app we wanted to multiple operating systems, and it was finished at far less cost that if we had done native app development."